Thinking of renovating your bathroom without having to spend a great deal? 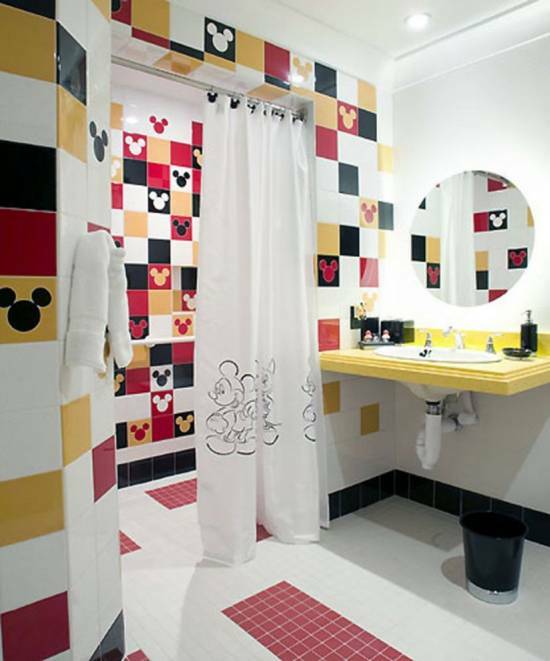 The best way to add character to your bathrooms is by decorating it with chic bathroom tiles. 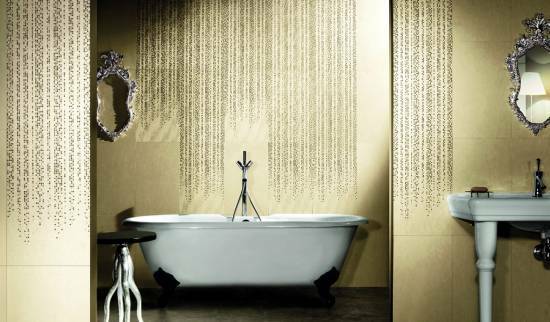 Bathroom tiles come in a variety of shapes and designs. They also range from being pretty economical to quite expensive as well. 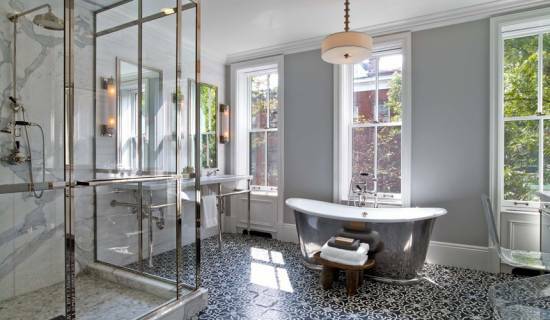 Going overboard doesn’t necessarily ensure that your bathroom is going to look beautiful; a few cleverly used chic bathroom tile ideas can ensure that you too can bathe in luxury. Below are the 15 Chic bathroom tile ideas in a variety of designs and which are surely charming enough to suite every palette. Check out the classic simplicity of this bathroom with its white tile with gray swirls. It’s not only appealing to look at but epitomizes a great deal of luxury. The built in alcove near the tub to hold the shampoo and the bath bubbles is a great idea and the tiles are in perfect harmony with the rest of the elegant white fittings in the bathroom. The glass door adds a modern yet classy touch. 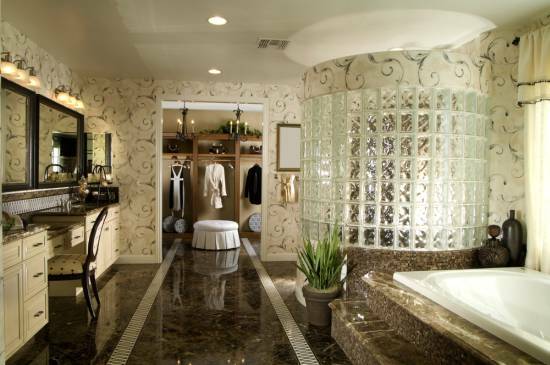 This tastefully decorated bathroom with breath taking mosaic floor tiles is the epitome of grandeur and beauty. Notice how the varnished tiles with the floral pattern are complimented by the presence of the detached tub and large mirrored shower. It is indeed the ultimate in opulence and beauty! 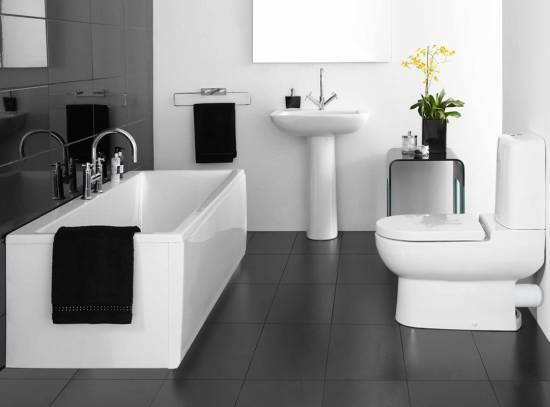 For those who love an aura of elegance and grace this lovely bathroom with its classy black and white tiles is quite inspiring. There is nothing more beautiful than the look of minimalism and exclusiveness created by these tiles. Gray is a color which is completely under rated; the right hue can make a subtle difference and change the whole look of your bathroom. The simplicity of this bathroom is made to look all the more appealing by the presence of these slate gray tiles. 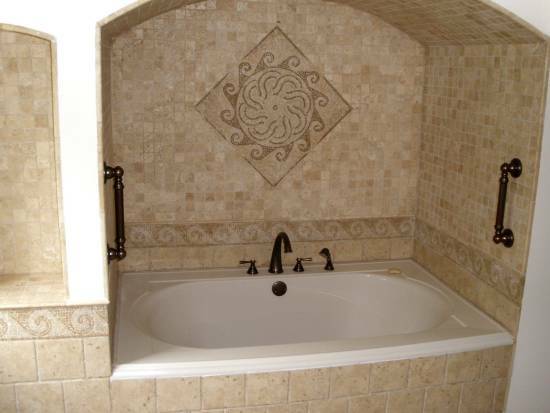 Check out the subtle look of country chic created by the amalgamation of 2 styles of tiles in this classy bathroom. The bath tub is accentuated by the presence of the flowery patterned tiles of the wall with the vanity mirrors ensconced upon it. 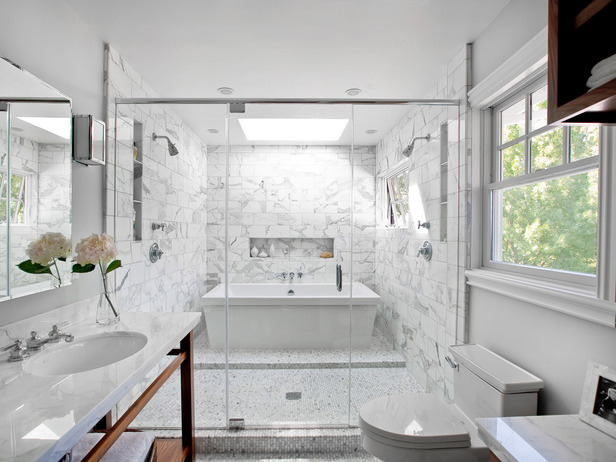 The larger tiles on the floor give the bathroom a look of having ample space. 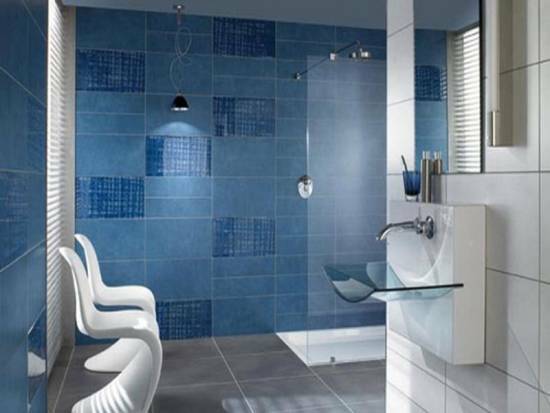 The lovely blue color of the tiles complements the modern and innovative fittings of this uber cool bathroom. You too can experiment with various shades of blue to bring a zing to your bathing time. It’s certainly an inspirational idea. The lovely glazed ocean pebbles engraved on the tiles brings in the image of the great outdoors to the walls of this bathroom. To add a certain exotic appeal to your bathrooms you can try matching these tiles with the rest of the tiles present in your bathrooms. Check out this unique japanese styled bathroom with its lovely patterned tiles. 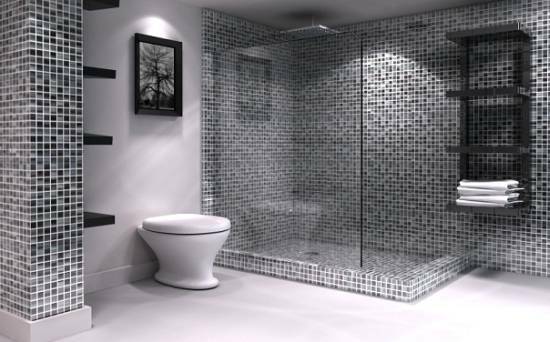 These tiles bring a completely innovative look to this modern looking bathroom with its steel tub and state of the art shower area. Definitely not for the faint hearted, this bathroom tile idea is for those who love to experiment and play with stunning visual displays. 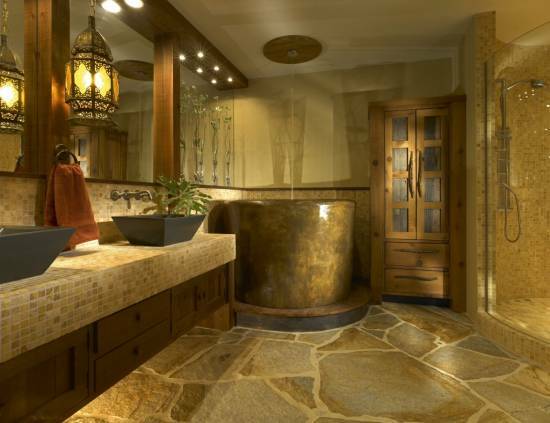 Check out this trendy looking bathroom with its granite tiles and stoned floors. Inspired from the Japanese style of decorating bathrooms this is one bathroom tile idea which would appeal to those who like minimalism in their life style! Marble is one particular material which evokes an image of grandeur without any other accessory. Take a look at this simplistic bathroom which is made to look luxurious because of the presence of marble tiles. One look at the gorgeous patterned tiled wall of this bathroom and you are inspired by the way it changes the whole look of the bathroom. For those who like all things unique this idea can certainly rouse their love for exclusivity. 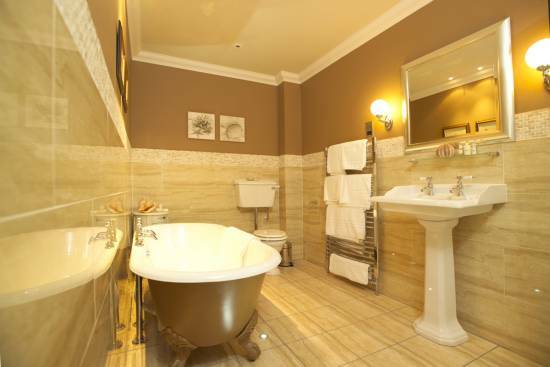 The gorgeous bathtub with its marbled alcove and checked tiles is indeed exceptional in its beauty. 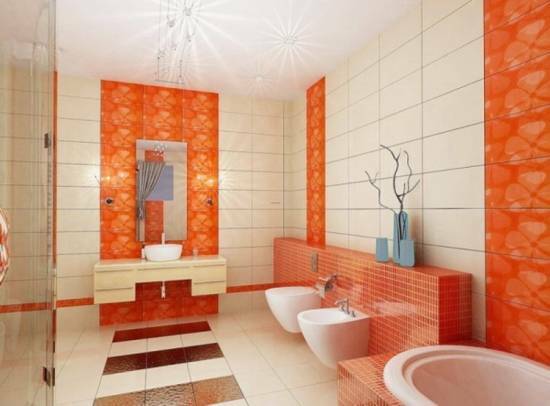 For those who are big fans of all things colorful this lovely bathroom interspersed with colorful yellow, green, orange, blue and red tiles is indeed quite appealing. You can change the color scheme according to your taste. The lovely colors complement one another while the white tiles placed in between balance out any flashiness. 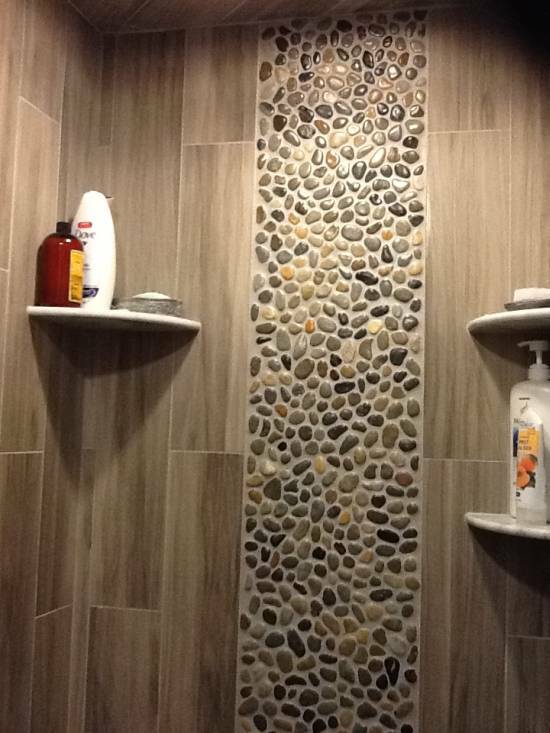 Check out the lovely art mosaic created by the tiles as a backsplash for the bathroom tub wall. It adds certain glamor to an otherwise boring bathroom and balances out the simplicity in a pleasant way. 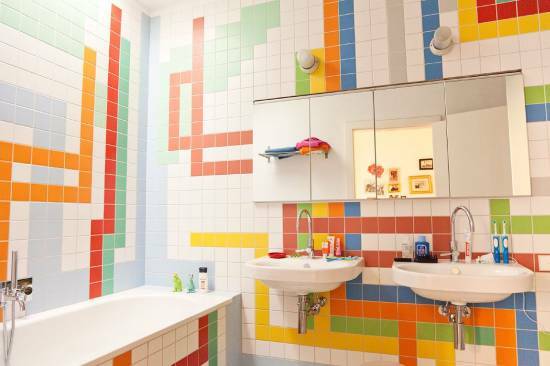 Check out this lovely and colorful backsplash of tiles created for a kids bathroom. The smaller tiles placed between the larger ones echo the basic idea of the backsplash and make it a wonderful idea for a children’s bathroom. For those who are completely romantic at heart this is one bathroom tiles idea which is stamped with their signature style. Check out the lovely rivulet patterns created by the tiles in a crafty way. 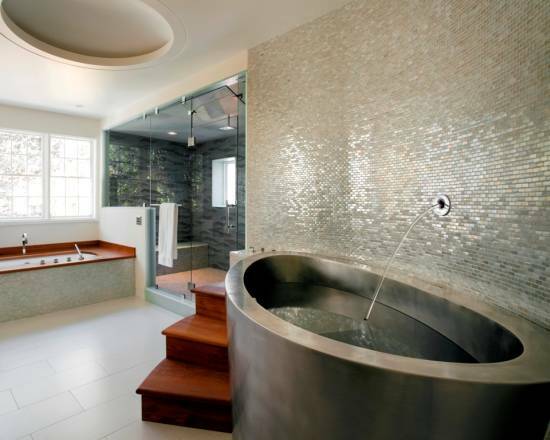 This combined with the elegant tub and the fanciful mirror epitomizes a fantasy of quixotic love! Choose your favorite bathroom tile ideas from any of the above 15 ultimate bathroom tile designs. You can also get inventive and produce masterpieces of your own by simply being inspired from these above mentioned ideas. A bathroom should be comfy and aesthetically appealing so that you may unwind after a long hard day and forget about your troubles while you envelope yourself in bliss of a clean shower or a wonderful bubble bath.